‘Promise’ created by Caroline McCarthy is like a candlelight vigil to nature; staged on the manufactured madness we now call food and, as with most art, the interpretation is up to you. Straight from closing USELESS at Green On Red Gallery this summer, Caroline McCarthy’s work is now part of Dismaland, Banksy's Bemusement Park: 'a festival of art, amusement and entry-level anarchism', which runs from 22nd August - 27th September 2015 near Bristol, UK. The project has been installed on a 2.5 acre site of the disused 'Tropicana' lido on the Weston-Super-Mare seafront. Dismaland, features the work of 58 international artists and includes 10 new Banksy sculptures. Caroline is the only Irish artist included in this display which features artists such as Damien Hirst, Jenny Holzer, Jimmy Cauty, Nettie Wakefield, and David Shrigley. 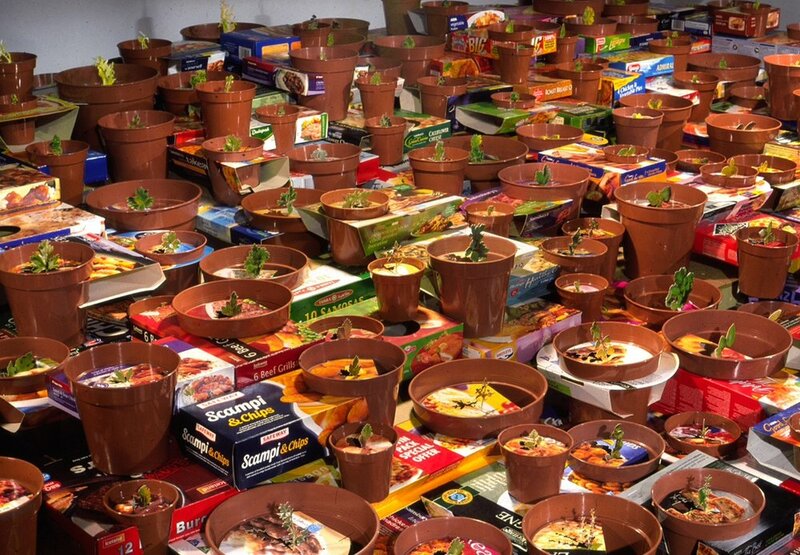 Her featured work, entitled Promise (2003), is made from over 200 different ready meal boxes, where the garnish on each is cut from its packaging and folded to stand up in the centre of individual plant pots. The plant pots are arranged according to garnish species, the display at first resembling a garden, but at close range the seedlings are seen to be cut from a bed of wholly manufactured produce. "There's been a great response to Promise, and the whole show. It's one that embraces a huge audience, not just the artworld. It's just been amazing to be part of!" - Caroline McCarthy talking about being part of Banksy's Dismaland. Caroline McCarthy was born in Dublin, Ireland, in 1971. She studied at the National College of Art and Design, Dublin, 1989 – 1994 and is based in London since completing an MA Fine Art at Goldsmiths College, London in 1998. Past awards include the Allied Irish Bank Artist Award in 2001; Open Award at EV+A 1996 and 2001; and a Multi-Annual Bursary award from the Arts Council of Ireland, 2007/2008, with works included in the collection of Irish Museum of Modern Art, Allied Irish Bank, Arts Council of Ireland, Zabludowicz Collection and many private collections. She recently co-curated Group Coordination, in collaboration with the Irish Museum of Modern Art and her work is currently touring internationally in Nature Morte, in association with Thames and Hudson. Solo exhibitions include USELESS (2015), Green On Red Gallery, Dublin, Ireland; From One End To The Other, various venues, Norwich, UK (2013); Made to Measure, Parker's Box Gallery, New York, USA (2011); Arrangements, Green On Red Gallery, Dublin, Ireland (2011); Hoet Bekaert Gallery, Ghent (2008); Gimpel Fils Gallery, London (2008); Galerie Bugdahn und Kaimer, Düsseldorf (2007); Void, Derry (2006). Theme parks continue to draw in thrill-seekers despite the risks - so why are we so addicted?